I’m so pleased to share with you all these Advent Journals. As you may have noticed, Advent is quickly approaching and there are so many wonderful resources available to help deepen and enrich your Advent experience. For the past few years, I’ve noticed a need for Advent journals that cover a few bases. 1. They are Scripturally based 2. They are simple 3. They are not time consuming but still powerful 4. They are free. I have 2 different journals this year so be sure to read to the bottom to hear about both. One is based on lectio divina, the other is a deeper look at the 4 Sundays of Advent. In the journal I’ve highlighted one or two verses from the daily readings for reflection. There is space to prepare yourself for lectio and think about what’s going on in your life that day. What’s joyful, stressful, exciting or bothering you? Your lectio experience is colored by what’s happening in your life and it is good to take a moment to acknowledge what you are bringing to the table. There is also a place for your Word or phrase that has been highlighted during your reading as well as your prayerful response to God’s movements in your heart. Finally, there is room to think creatively about what God is calling you to do or change as inspired by the day’s prayer. 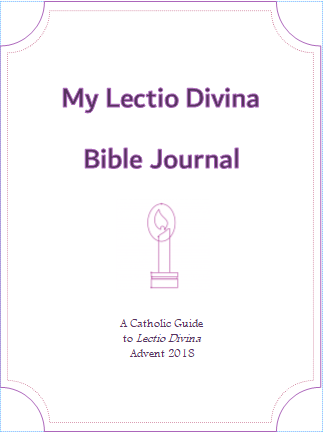 The journal includes an overview of what lectio divina is, how to pray it and why it’s such a rich experience of prayer. As I said, I have chosen one or two verses for your reflection. However, maybe you already have a habit of reading the daily readings. Maybe a different verse stood out to you. At the very end of the journal is a blank page. It has all the formatting and different writing spaces, but the Scripture portion is blank. You can use this page to write your own verses in. Remember, this is completely free and is a pdf. So you can print the whole thing if you are going to use the verses I chose. Or you can print that last page 30 times and fill in your own verse every day. Or maybe you’re overwhelmed and already have a daily Advent devotional but want to give lectio divina a try – just print a week and see how it goes. Maybe every Sunday would work better. This is completely customizable to you. This is the brand new journal and I’m so excited about. I was inspired by a few things. First by my long-term writing project on the Philippians 2 Christ hymn. In that project, I am doing a deep study of the hymn, looking at the historical, theological, ecclesial, and liturgical significance and why it is a piece of Scripture that we all should know inside and out. I was also inspired by Every Sacred Sunday and how their Mass journals encourage Catholics to spend quality time preparing for Mass. If you are looking for something long term to help you dig deeper into the Sunday readings all year long, I cannot recommend their journals enough. My new Advent Journal works like this. The first and super important thing you need to know is that it starts on Nov. 26. Yes, that’s before Advent actually begins. But, if you are going to be preparing for the 4 Sundays of Advent, you’ve got to start before the first Sunday, right? Ok, got that cleared up. Mondays we spend time with the First Reading. Tuesdays the Psalm. Wednesdays the Second Reading. Thursdays the Gospel. Each page has the reading as well as space for any notes, questions or insights you might have while reading. There is also space for a brief prayer or reflection on what you’ve read. Think of this as lectio divina lite. Friday’s I offer a theological reflection on the readings. These include any historical information that is relevant, how the readings fit together, and what they can say to us today. It concludes with a quote from a saint that illuminates the overall theme of the Sunday. Saturday encompasses how we can take what we’ve learned and grow in the week to come. I include another brief reflection, followed by questions or ideas meant to inspire you to apply the readings to your daily life and enhance your Advent experience. Sunday is a simple page for homily notes or other reflections you have on these readings. Perhaps you have another Advent devotional you are doing side by side and want to write down a special quote or work through a new idea. Here is space to do it, especially in light of the Sunday readings. Click below for a closer look at the Four Sundays of Advent Journal. You will be opening a pdf document which you can print for your own personal use. I’m so excited for your Advent journey. It would be great to hear from you which journal you chose and why. I love feedback and want to keep developing these into quality, useful tools for you to deepen your relationship with God. Do please share with anyone you think would benefit from these journals. Kate–I loved your Lent journal, so I am super-excited about these. (I just don’t know which to choose!) 😉 I’ll probably try both. I just printed the “Going Beneath the Surface” Journal out and I am so excited to begin. I’m leaving it next to our Advent Wreath in preparation. Thank you for putting your gifts to work in benefit of me and so many others – you and your family will be in my prayers of Thanksgiving! Hi Mary! Thanks for sharing which journal you picked. I hope it helps you have a beautiful Advent experience! Thank you so much for the beautiful and thoughtful journals. I started the Beneath the Surface on Monday and it has helped me to focus and prepare for Advent. My 13 year old daughter wanted me to print one so she can join in, too. I printed the Lectio Divino one this morning, since I really need to get back in the habit of the beautiful tradition. Your Blog is lovely and I’ve enjoyed perusing it.